1. The word count for the document is displayed in the bottom left of the ReportComplete status bar. 2. 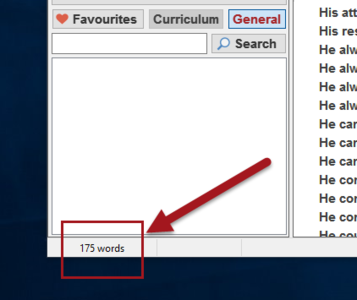 You can turn on a per subject word count by clicking the View icon then selecting 'Show subject word count'. The number of words is then displayed vertically within the Completion Bar on the far left of the report. 3. 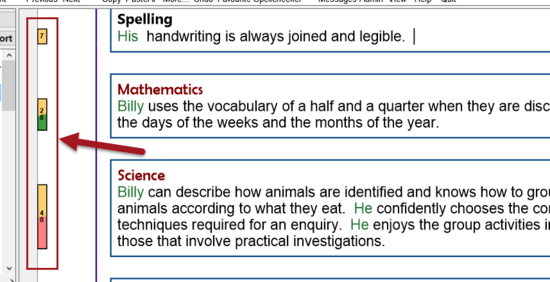 If word count limits are set for a particular subject, the Completion Bar has a two-tone appearance. The top half operates as before and the bottom half is an indicator to show started (amber), target number of words (green) or over the text limit (red). 4. If the subject word count is turned on (see above) then you can also see the word count in the Student Manager. Word count is a recent addition to ReportComplete so older reports may not have word count data as they haven’t been edited since word counter was introduced. As with completion status, you may need to click the 'Refresh' button to see more up to date information. This page was last modified on 21 March 2016, at 11:55.